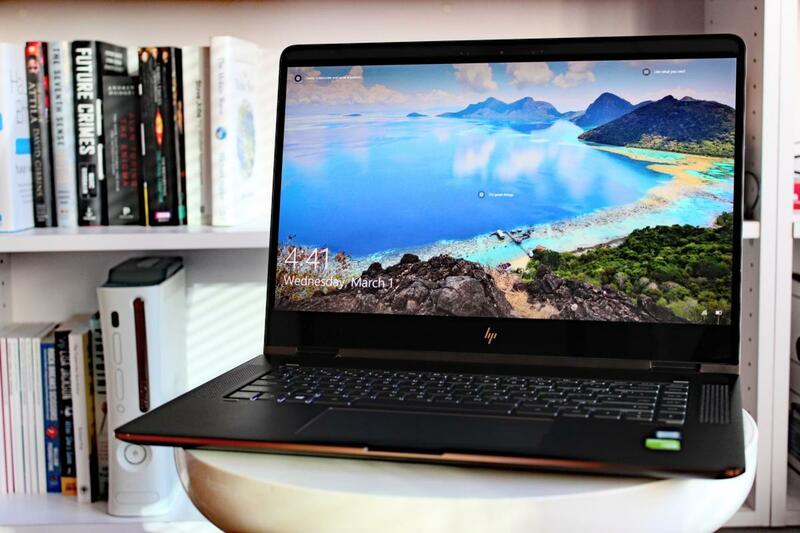 HP has crammed everything but the kitchen sink into its affordable thin-and-light 15.6-inch laptop. Not everyone needs a quad-core processor and a dedicated graphics chip in a 15-inch laptop, much less a thin-and-light one. At least, that’s the wager HP made last year with its Spectre x360 15. The company packaged a dual-core CPU with integrated graphics and full-HD screen in an aluminum body, kept the weight at four pounds, and charged just $1,150. The resulting 2-in-1 laptop offered the right mix of portability, performance, and value. If you only needed to check email, watch YouTube videos, color-correct the odd photo here and there, and edit documents—and you prefer not to lug around a tank—you had an affordable option. It looked great, too. For 2017, HP has upped its ante and gone all-in on the value front: A Core i7 processor, 4K UHD touchscreen, discrete graphics, and larger 79 watt-hour battery are now standard features in the Spectre x360 15. And while the price has gone up, it’s not by as much as you might think. The Spectre x360 15 now starts at $1,280 for a 3840x2160 touchscreen, Core i7-7500U processor, 8GB DDR4 RAM, 256GB M.2 PCIe-NVMe SSD, Nvidia GeForce 940MX graphics, and 79.2 watt-hour battery. For comparison’s sake, the 2016 Spectre x360 15’s base model featured a 1920x1080 touchscreen, Core i5-6200U processor, 8GB of DDR3 RAM, 256 M.2 SSD, and 63 watt-hour battery for $1,150. Our review model is the $1,500 mid-tier version, which comes with a 512GB M.2 PCIe-NVMe SSD and 16GB DDR4 RAM. The most dazzling piece of new hardware is the 15.6-inch IPS 4K UHD touchscreen. Colors look rich and bright, and details are beautifully crisp. The latter is most apparent when sifting through digital photos—it’s a welcome touch of luxury when editing a snapshot. Paired with the display is a larger battery, which compensates nicely for the more power-hungry screen. (Skip down to the performance section for full details.) In fact, battery life isn’t negatively affected at all by the higher-resolution panel—it’s actually slightly better this year. The Core i7 processor and the discrete graphics are more modest upgrades, but they do afford some small performance boosts. As you’ll see when we go over performance, it’s not enough to shock anyone, but it’s certainly nice to have at the ready. 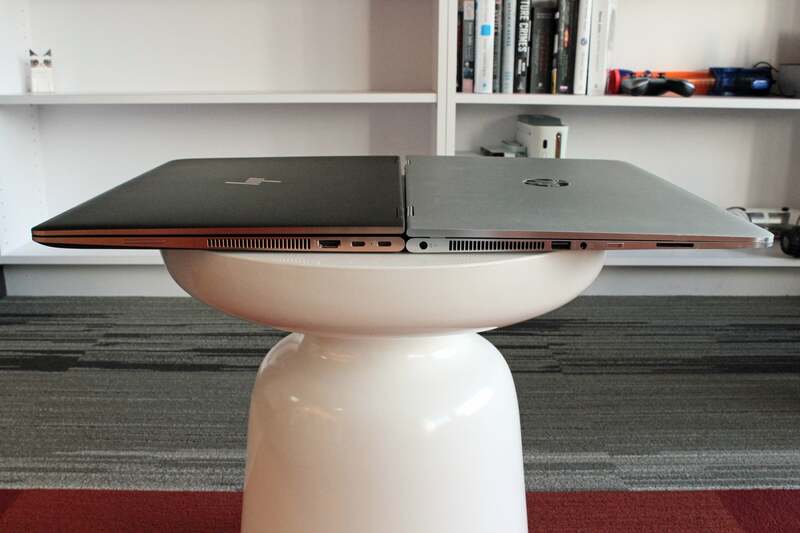 Not all of HP’s makeover is as delightful as the hardware upgrades. 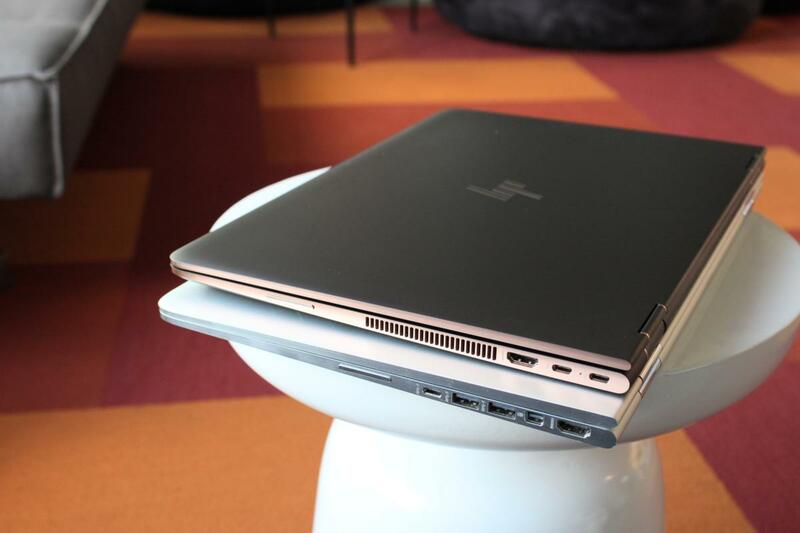 The facelift on the chassis is a mixed bag: While its footprint has shrunk, this laptop has also fattened up. On paper, it sounds minimal. Our digital caliper puts last year’s Spectre at 16.3 millimeters (0.64 inches) at the back edge, which then tapers down to 14.8 millimeters at the front edge. This year’s Spectre, on the other hand, starts at 18.0 millimeters (0.71 inches) at the back edge and finishes at 17mm at the front edge. The change in dimensions makes sense, of course—HP shrank the length of the Spectre x360 15 but still squeezed in a larger battery. The 2017 Spectre x360 15 (top) has a more compact footprint but a thicker frame than last year’s model (bottom). In the hand, however, the new Spectre feels a lot chunkier than its predecessor. That’s especially so because it’s heavier now, too: Our review model packs an additional 4.5 ounces versus last year’s loaner. When I pick it up, I now have more the sense of carrying a fancy budget laptop than a sleek ultraportable. It’s a real shame, too, because in this regard, the Spectre has ceded some of its advantage over its heavier quad-core rivals. For example, Dell’s Kaby Lake XPS 15 configured with a bigger 97 watt-hour battery weighs just an ounce more than our review unit. You also lose a couple of ports with the downsizing. Last year’s model came with three USB 3.0 Type-A ports; one USB 3.1 Gen 1 (5Gbps) Type-C port; full-size HDMI; Mini DisplayPort; and a headset jack. This year you get just one USB 3.0 Type-A port; a Thunderbolt 3 port that supports charging; a USB 3.1 Gen 1 (5Gbps) Type-C port that supports display output, data transfer, and charging; full-size HDMI; and a headset jack. 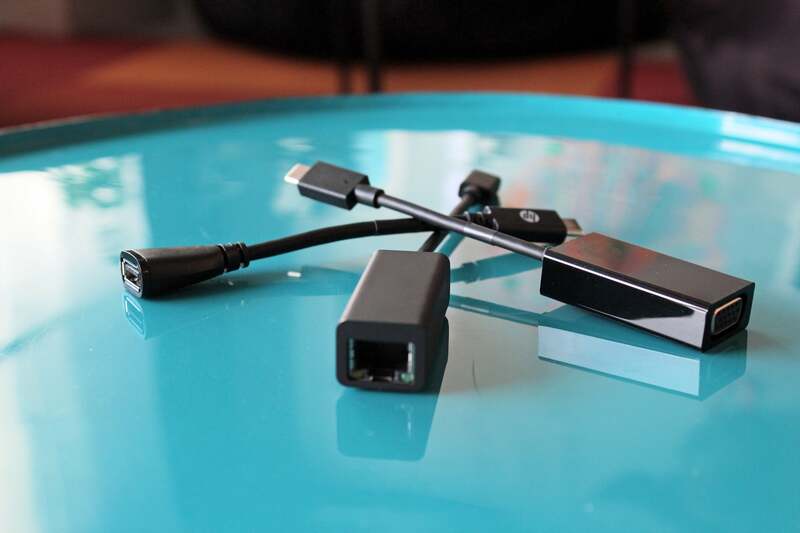 Fortunately, the types of ports included comprise a very functional assortment, so even though there’s no longer a dedicated Mini DisplayPort or more than one USB 3.0 Type-A port, you should be equipped for a variety of environments. HP generously includes a handful of dongles in the box, too: USB-C to USB-A, USB-C to VGA, and USB-C to ethernet. Correction, 3/16/2017: We checked in again with HP about the inclusion of the dongles after a reader noted that none were in the retail box, and have been told they are actually separate accessories. This is disappointing, but our overall opinion of the machine and its value remains the same. Though HP packed these three dongles along with our review unit, you'll have to buy them separately. Some of the changes to the body are superb—like the updated keyboard and trackpad. Last year’s Spectre x360 15 had adequate key travel but felt mushy when typing. This year key presses are crisper, making for more pleasant tactile feedback (and in my case, improved accuracy when typing). For its part, the trackpad has a smoother finish, and more importantly, better palm rejection. On last year’s Spectre, the combination of the ultra-wide trackpad and my default hand position for typing often caused tabs to switch randomly or the cursor to migrate from the active window. On this revamped version, that happened only twice. 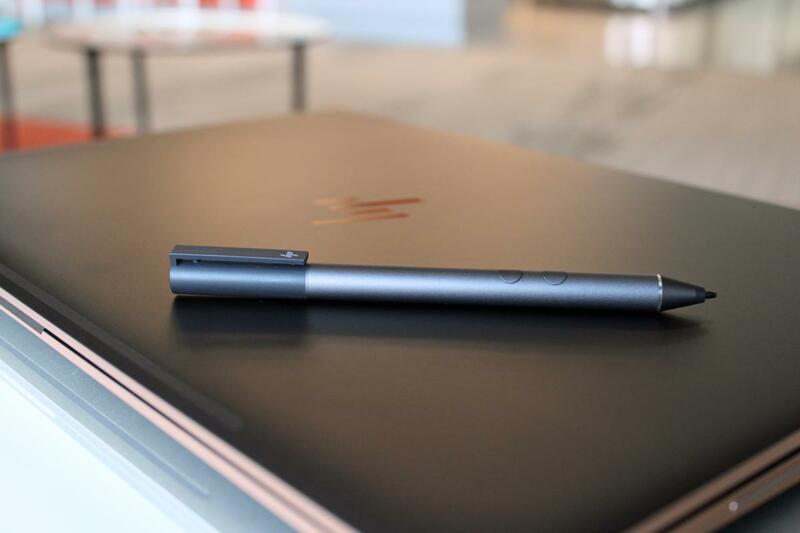 A stylus now comes included with all models of the Spectre x360 15. Also excellent are the newly added pen support and the included stylus, in terms of both value (Microsoft’s Surface Pen used to be an optional $60 accessory) and accuracy. I generally find it hit-or-miss when using a stylus to take notes or make a rough sketch, but my tipsy handwriting and uneven lines were captured accurately. Just another way that HP crams more extras into this new Spectre x360 15 than we expected. Overall, the Spectre x360 15 edged out last year’s slate of dual-core Skylake machines, including its predecessor. With its i7-7500U processor, 8GB of DDR4/2133 RAM, and PCIe-NVMe SSD, it has the benefit of a higher-clocked CPU with more threads and Kaby Lake’s improvements, as well as faster memory and fast storage. Probably the most exciting of the results have to do with the battery life. Let’s dig into the details. HP lists the Spectre x360 15 with DDR4/2133 RAM but says it’ll use DDR4/2400 when available. Our review model actually came with DDR/2400 RAM. HP designed the Spectre x360 15 for people who primarily do everyday tasks like web browsing and document editing on a laptop. So, for our first benchmark, we broke out PCMark 8’s Work Conventional. It’s a synthetic test that simulates those exact kinds of activities, and then assigns a score to indicate performance level. In our experience, any result of 2,000 or more points should easily handle basic work. The 2017 Spectre sits near the front of the pack, right between the Dell XPS 15’s Skylake quad-core part and the other laptops also sporting that dual-core Kaby Lake i7-7500U chip. What’s most significant about the result isn’t the score compared to the other i7-7500U notebooks or even the XPS 15. It’s the number itself. Remember, a score of 2,000 is what we consider acceptable performance. At that threshold, the machine should run smoothly when you’re, say, chatting over Skype and flipping through multiple browser tabs. With a result of 3,348, most anyone would be hard-pressed to notice a difference between the Spectre and a quad-core competitor—even when it’s a Kaby Lake quad-core rival, which will likely outperform this Spectre by about the same amount as the Skylake XPS 15 does the 2016 Spectre. When examining pure CPU performance, however, the limitation of a dual-core chip becomes very clear. To see how this convertible’s processor held up during short bursts of intense activity, we fired up Maxon’s Cinebench 3D rendering test. It takes just a few minutes but hammers on just the CPU the whole time. Since it scales well with core count, the quad-core laptops have a big advantage here. You’re looking at nearly twice the performance—and that’s between a last-gen Skylake quad-core and Kaby Lake dual-core. The XPS 15 has a 95.1 percent increase over the Spectre x360 15, and the Samsung Book 9 Pro (which also has a 6700HQ) manages a 84.5 percent increase. 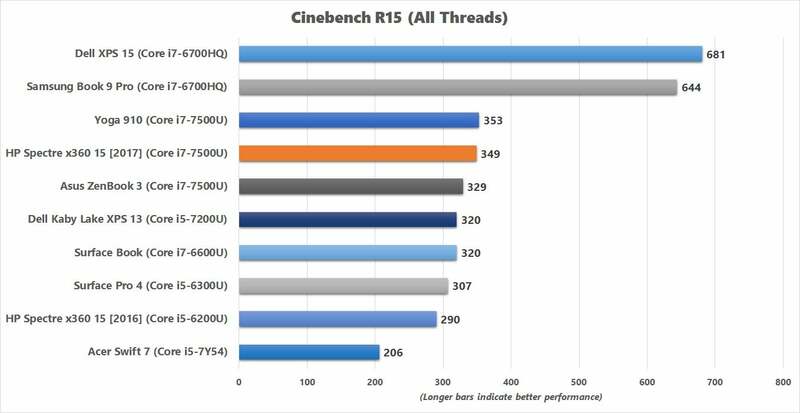 Given these numbers, the current-gen Kaby Lake XPS 15 should easily double what you get from the current Spectre. Practically speaking, this benchmark shows that when push comes to shove, you reap definitive benefits from those two additional cores—even when that push is a brief one. Still, among its dual-core peers, the Spectre’s no slowpoke. It holds its own, with Lenovo’s 13-inch convertible outdoing it by just one percent. 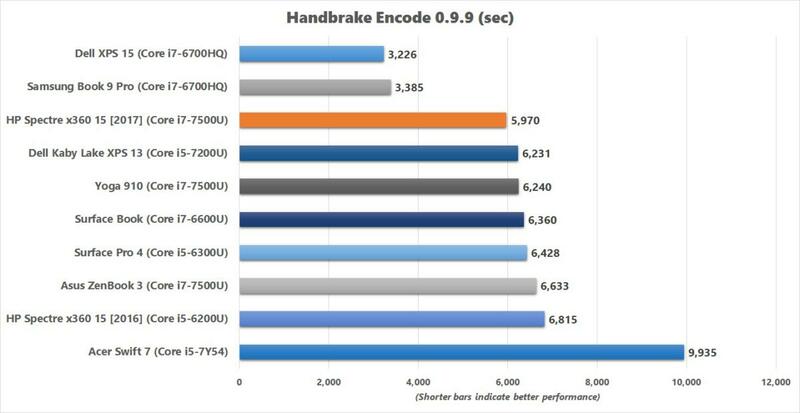 Our Handbrake encoding benchmark further showcases the divide between the dual-core and quad-core processors. This real-world test involves converting a 30GB MKV file to a smaller MP4 using the software’s Android Tablet preset, and since Handbrake loves core count and clock speed, the more of each you throw at it, the better the performance. Now, the purpose of this benchmark varies, depending on the type of notebook. For dual-core laptops, it’s a torture test. Since the encoding process hits the CPU for such an extended period (we’ve seen it go as long as three hours), running Handbrake can reveal any odd design quirks or issues with cooling. Some machines stay at a rock-solid clock speed throughout the encode, while others throttle back or fluctuate dramatically. 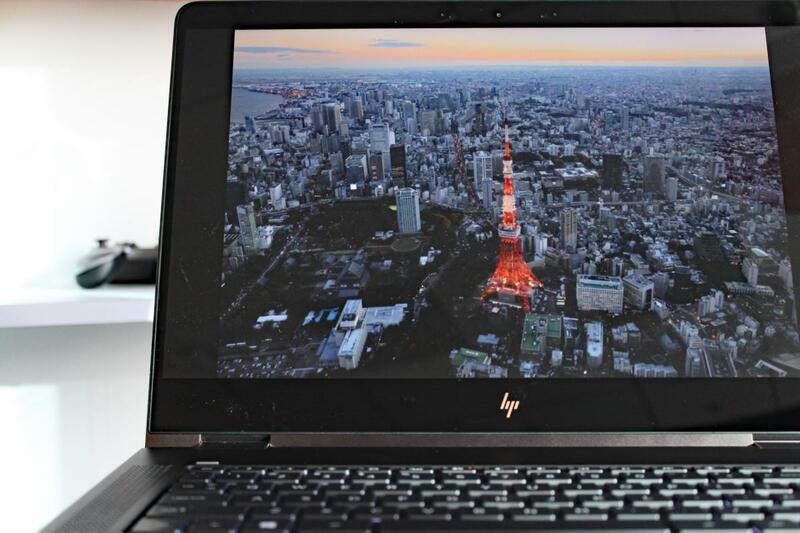 For quad-core laptops, we use it to assess how worthwhile a system is for content creation. Since the beefier processors in these notebooks are sufficient for lighter video edits and encodes, running Handbrake tells us which ones hold up best for work on the road. We also get to see which systems have better cooling, which stay quietest, and which maintain higher clock speeds (and thus finish faster). When you pit the two types of laptops against each other, the outcome is grisly. The dual-cores are forced to compete against the quad-cores’ ability to actually get stuff done, and they lose by big margins. That last-gen Core i7-6700HQ provides another near-doubling of performance: The Dell XPS 15 finishes the encode in 53 minutes, and the Samsung Book 9 Pro in 56 minutes. The Spectre x360 15 trails behind at 100 minutes. 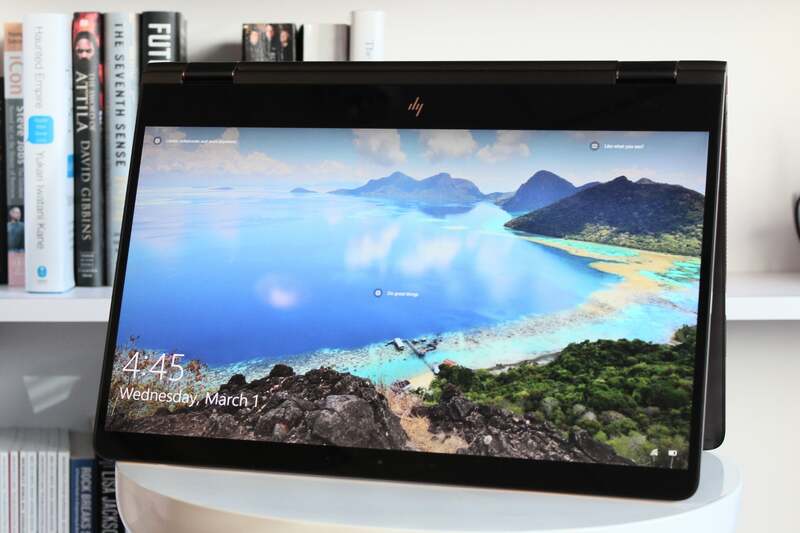 The short of it is, HP doesn’t expect you to do content creation on the Spectre—after all, the whole point of this convertible is to give users just enough without charging them for features they don’t need. Should you ever want to encode a file with a dual-core laptop, however, the Spectre is one of your best options. Its bigger frame likely gives it the advantage of a stable clock speed, even if it’s slightly throttled—throughout the task, its i7-7500U held steady at about 3.1GHz and 70 degree Celsius when we monitored it through Intel’s Extreme Tuning Utility. On the flip side, the quad-core notebooks guzzle more electricity. Unplug them from the wall, and their staying power is modest. For our battery-life benchmark, we first set each laptop’s screen between 250 and 260 nits—a fairly bright level that’s adequate for indoor lighting conditions. Then we charge the system to 100 percent, load a 4K video in Windows 10’s Movies & TV app, and then let the file run on continuous loop until the machine shuts itself off. Last year’s Spectre x360 15 chugged on for hours after the XPS 15 and Samsung Book 9 Pro had died. This year, however, we fired up this test not knowing if the tides would shift. Since the current Spectre comes equipped with a 4K touchscreen, we wondered whether the bigger battery would compensate for a more power-hungry display. Turns out it does, and then some. With a finish of nine hours, the 2017 Spectre outlasted its predecessor by 54 minutes. The 4K touchscreen isn’t a liability at all. Of course, our battery test did run on integrated graphics. (It’s the rare exception for a laptop with a discrete GPU to not do so, actually.) Don’t expect as long a runtime if you load programs that fire up that GeForce 940MX. Incidentally, the Spectre’s 940MX is a nice perk. It may not be as exciting as Nvidia’s Pascal chips, sure. But this modest last-gen GPU is more affordable, less of a power hog, and still punches harder than integrated graphics. 3DMark’s well-respected graphics test does a nice job of illustrating that latter point. 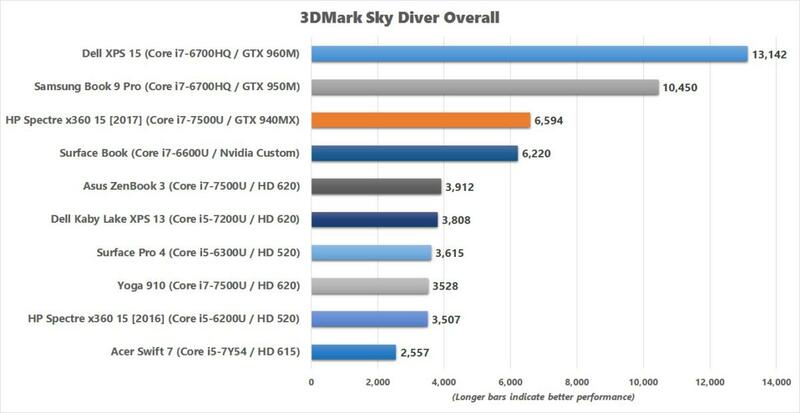 In Sky Diver, which simulates 1080p gaming on Normal settings, you can clearly see the leap in performance. The 88 percent increase means smoother experiences for both work and play. Programs that lean on the GPU for acceleration (like Photoshop) should run faster, and gaming at 720p is quite doable. And yes, that’s for AAA games, though of course your mileage varies depending on the game’s age: Older blockbuster games like BioShock Infinite and Tomb Raider ran just below 60fps on Very High (57.7fps) and High (58.4fps), respectively. Slightly newer games like Middle-earth: Shadow of Mordor required dropping down to the Lowest preset to achieve 60fps. And in the year-old Rise of the Tomb Raider, you’ll barely reach 45fps on the Lowest preset. That said, the Spectre x360 15 has a lot more competition this year. Dell in particular has greatly expanded its XPS 15 configurations with the move to Kaby Lake. While you don’t get all of the same perks, the competition means you have a greater ability to pick the features you really want and ignore the ones you don’t. For example, if cost rules all, you can skip the 4K screen, PCIe-NVMe drive, and discrete graphics in the Spectre x360 15 and instead choose the $1,000 XPS 15 with a 1080p non-touch screen, 35-watt Core i3 processor, 500GB hard-disk drive, and no discrete graphics. Opting for one of those Dell XPS 15 configs won’t get you everything though, and it certainly won’t get you a near-perfect balance of looks, performance, and value. For now, HP still has a lock on that sweet spot. HP's refreshed Spectre x360 15 offers the premium features that most people want for a surprisingly affordable price.